There is a common belief today about cavities that once you have tooth decay, that cavity can NOT be reversed or healed. Then the only solution is to have part of your tooth drilled out and filled with a synthetic material. But according to a study published in the British Medical Journal cavities and tooth decay could potentially be healed or reversed with diet. A study was performed on 62 children with cavities and they were divided into three different diet groups. Group 1 ate a standard diet plus oatmeal (rich in phytic acid). 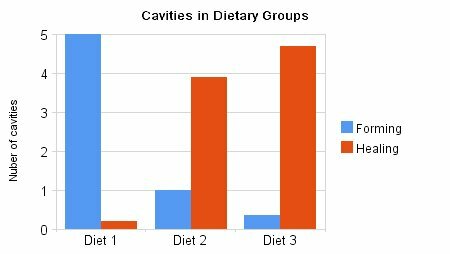 Group 2 consumed their normal diet and supplemented with vitamin D. Group 3 ate a grain-free diet and took vitamin D.
The results found that group 1 who had a diet high in grains and phytic acid had an increase in cavities. Group 2 had improvements in cavities and less form. Group 3 who followed a grain-free diet rich in vegetables, fruits, meat, milk and took vitamin D saw the greatest improvements in which nearly all cavities healed. This study along with the backing of many doctors and dentists is proving we have been misinformed about what causes cavities and if they can truly be reversed. Dentist Ramiel Nagel who authored the book Cure Tooth Decay has helped many of his patients “reverse” their tooth decay and would rather not put in fillings. 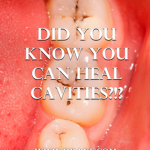 He believes that you can prevent and heal cavities with nutrition. In this article I am going to go over the causes of tooth decay and how it may be prevented and in many cases even reversed. To understand the link between diet and tooth decay we must start with one of the most well-respected dentists who ever lived Weston A. Price. West A. Price lived in the early 1900’s and was the chairman of the National Dental Association (1914-1923), and a pioneer for the ADA. Weston Price traveled the world searching to discover what causes tooth decay. Dr. Price found a common link between eating modern foods and cavities. He witness that many indigenous isolated tribes had perfect teeth and little tooth decay. But once they were exposed to a western diet they experienced tooth decay, bone loss and chronic illness. But the truth is the ADA is only hitting on 1 of the 4 things that could contribute to tooth decay. Let’s discuss the 4 aspects that cause tooth decay and how they can be addressed with diet. Removing Sugar – Probably the worst culprit of them all for anyone who desires healthy, cavity-free teeth, sugar should be avoided like the plague. Not only does sugar feed oral bacteria that prevents a healthy flow of dental fluids, it is highly acidic and can literally decalcify or demineralize the structural content of teeth that create dental decay. This means staying away from soda, candy, and baked goods with sugar. Additionally, use raw honey and maple syrup and drink juices sparingly as too much sugar can contribute to cavity formation. Be careful of artificial sweeteners because of their health risks as well. Bottom line: Make stevia your new best friend along with raw honey in moderation! Removing Phytic Acid – Phytic acid (phytate) is a mineral blocker and enzyme inhibitor found in grains, nuts, seeds and beans which can serious health problems in our diets. The main reason phytic acid has become an issue today is because we have stopped ancient food preparation techniques such as sprouting or sourdough fermentation which kills off the phytic acid. According to research published in the The Lancet a diet high in phytic acid will create mineral deficiencies and cause osteoporosis. 80% of phosphorus in grains and beans is bound to phytic acid so it is completely un-absorbable. In addition to blocking phosphorus availability in humans, these molecules bind minerals necessary for oral health such as calcium, magnesium, iron and zinc; thus, causing them to be unavailable for proper utilization. Consuming foods high in phytic acid decreases magnesium absorption by 60% and zinc by 20%. Phytic acid not only doesn’t allow you to absorb in minerals in your food, it also leaches minerals out of your body, bones and teeth! Subsequently, the powerful anti-nutritional effects of phytic acid have been known to cause digestive disorders, lack of appetite, nutrient deficiencies, and tooth decay. A good rule of thumb is to limit your grain consumption and stay completely clear from unfermented soy products. Because phytic acid is much higher in foods grown using modern high-phosphate fertilizers than those grown in natural compost, try to only eat foods that are organic and GMO-free. If you are aiming to improve your health and reverse cavities, foods high in phytic acid like grains, beans, nuts and soy should be avoided. However, if you soak grains or nuts and then sprout them or do sourdough fermentation you can reduce phytic acid by around 50 – 100%. Raw Dairy and Nutrient Rich Foods – Raw dairy is filled with the vitamins and minerals that contribute to a healthy dental fluid flow and help maintain strong teeth. Loaded with calcium, vitamin K2, vitamin D3, magnesium, phosphorus, and fat-soluble vitamins it is a good idea to consume raw dairy products at least weekly. I recommend goat’s milk kefir, raw cheeses and organic grass-fed butter are great options. High vitamin D – get plenty of sunshine and days not in sun supplement with 5,000IU daily of D3. Nuts, seeds and beans only that have been sprouted. You can find sprouted nuts and seeds at: bluemountainorganics.com. Don’t let the 20 minutes time frame deter you. You won’t even notice 20 minutes have gone by if you do this during your normal morning routine (i.e. while you shower, put your clothes on and prep for the day). Immediately afterwards, rinse your mouth out with warm water. Use salt water for added antimicrobial properties. Note: This should be a relative relaxing process, so don’t feel compelled to vigorously swish your mouth with oil for the entire time or else you’re bound to get sore jaw muscles. Simply and gently move the oil in your mouth and through your teeth without swallowing any of it. In a nutshell, these are the best ways to naturally reverse cavities. Take charge of your oral wellness today and show off your new, healthy smile with pride!